Spasms of Accommodation: Is Something Wrong with Thirsty? Last night I checked the tracking number on some coveralls I ordered last week and realized they've been sitting up by my gate in the rain since Wednesday. This morning I got in my car and drove up there to get them. (That's how sick I am. I would normally walk.) When I got back I saw Thirsty the Deer bounding down my trail behind the house. Whoops, didn't mean to scare him away from his drinks. I turned off the car, and sat still. He stood at the bend in the trail and watched me. I got my package, opened the door, got out, closed the door gently, opened it because it didn't close all the way, slammed it, and Thirsty stood there. 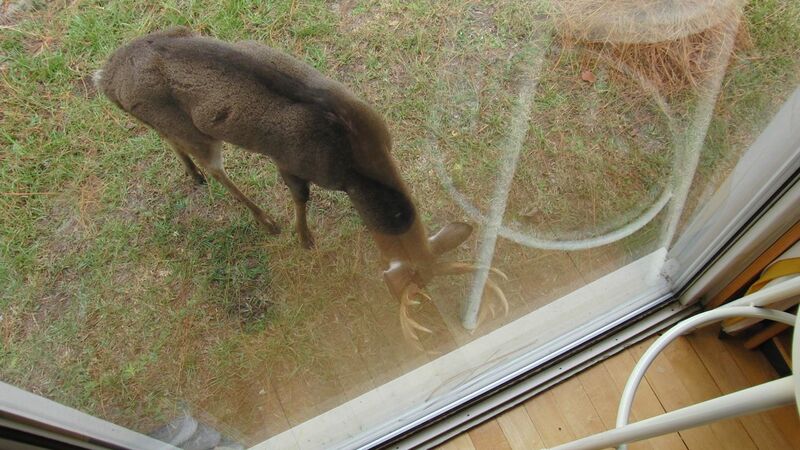 I came in the house and got the camera and looked out the west facing window and he was still there. I made toast and tea and he made his way on over to the birdbath. I ate my toast and took his picture and drank my tea. Then I shot 20 solid minutes of video of him browsing and drinking and staggering around below my window. He acts totally stoned. My aunt watched yesterday's video and DAMMIT! He just whacked my house with his antlers. He's still out there as I'm typing this. It's 12:48. I took that first picture of him at 10:44. He's back at the birdbath right now. Anyway, my aunt thinks he moves like she does when she has the flu. She thinks he's not well from all his fighting injuries. That's a good theory. My other theory is that he's been eating poisonous mushrooms. 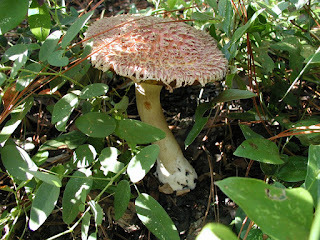 I have video of him eating two big boletes from my lawn today. 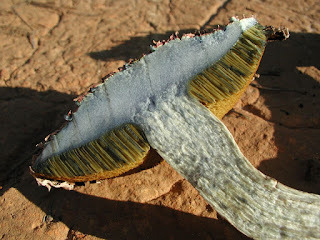 I know I have some of the poisonous ones out there, the ones that turn blue when you cut them. I also have some that are good to eat cause I've eaten them, so maybe he knows what he's doing. I can't really say. 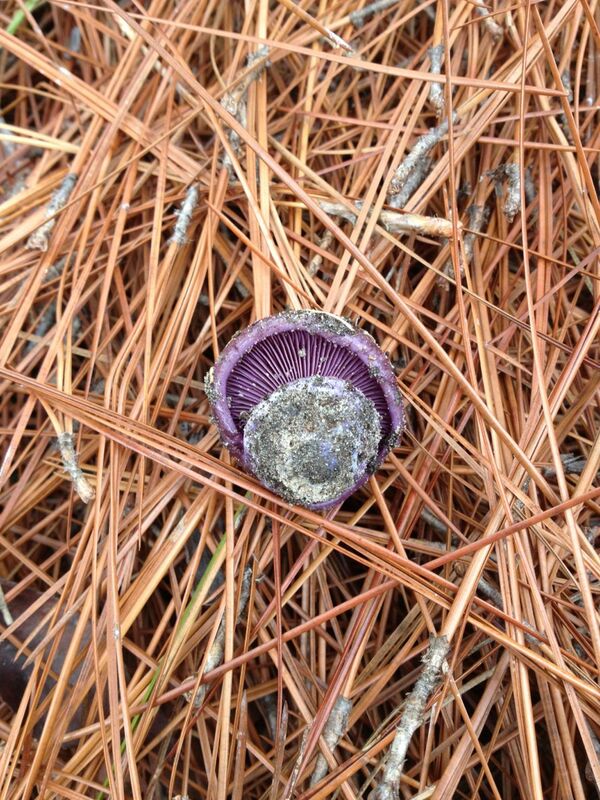 right where Thirsty has been eating mushrooms today. inside too. It didn't turn blue when exposed to air. Might be ok for a deer to eat. I've given up being stealthy when he's out there. I'm just going about my business and he can go about his. He clearly doesn't give a damn. It's possible that he acts so different from all the does that come through my yard because he's the big damn boss out there. 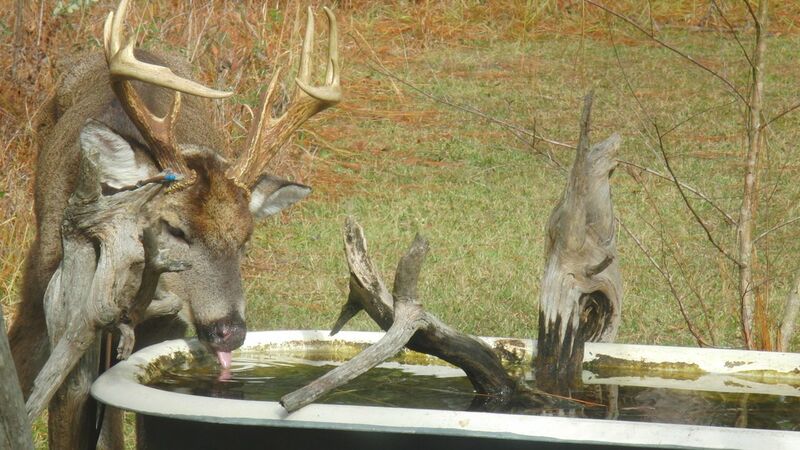 Or maybe because he used to be the big damn boss and that other buck that chased him into the bathtub on Wednesday morning took over his territory and confined him to my yard. I don't care so much right now when I'm staying in. But when I go back to my routine of messing around in the yard all day going back and forth to work on the Spartan what happens? Is he going to try to chase me out of his territory? It can't be normal for him to be so thirsty. I can visibly see how much water he's drunk out of that birdbathtub. Now he's sniffing my lawn again. He likes the part where I raked up the pine straw. Is he like a truffle-sniffing pig? 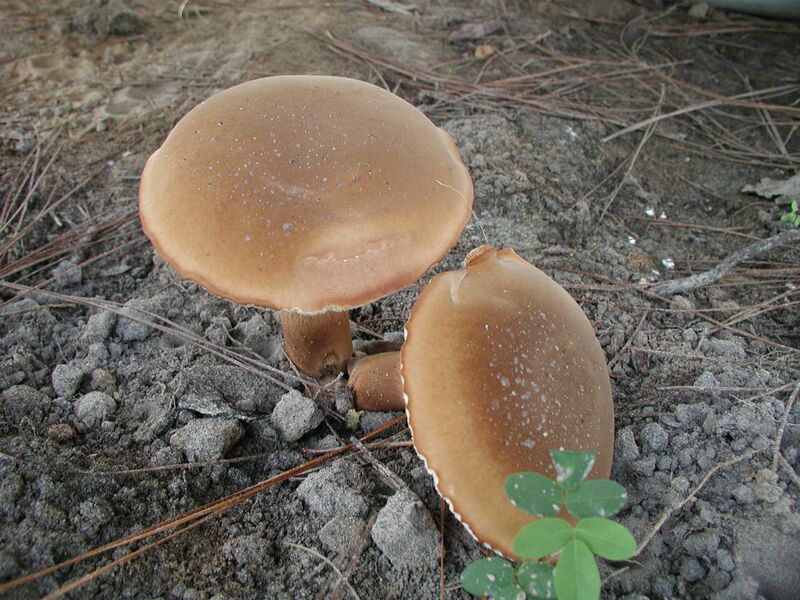 Is he looking for more fruit de fungi? And he's drinking some more. Now he's standing there chewing his cud like a bachelor eating a bowl of cereal over the sink. It really is extraordinary. I saw his sides heave when he erped it up. Why doesn't he go lie down behind the shed and do that? He has to stand over the bathtub? More and more like a child. Where are his manners? He wandered off to browse the lawn some more and now he's drinking again. 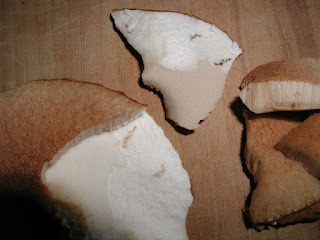 I've been looking for pictures of mushrooms. It's 1:18pm. He's been in my yard for 2 1/2 hours and this is the time he's supposed to be sleeping, isn't it. Has he got some kind of deer insomnia? Here are some other mushrooms that grow in my yard. These pictures aren't recent, but the are from right here around my house. 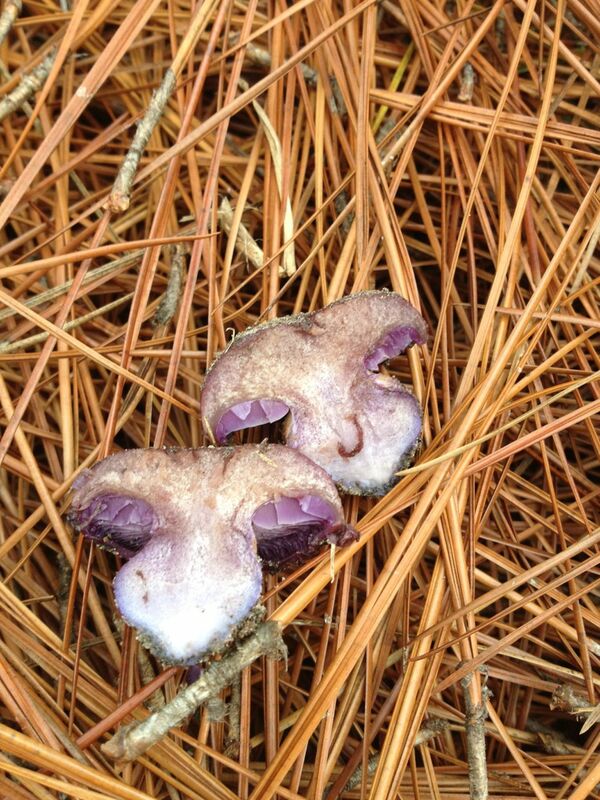 Mushrooms being what they are, they come back in the same place. 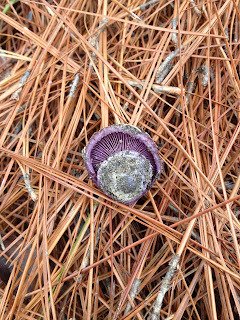 It's been warm and rainy this week which makes mushrooms pop up. This is not one I'd eat. When you cut it open the flesh turns blue. That's bad. when I was raking last time. I think this is what he just ate. It's a bolete with the tube things instead of gills. 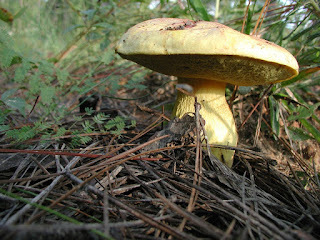 This is another kind of bolete that grew under my house in the summer. Here it is on my cutting board. It doesn't turn blue when you cut it. in butter and ate it on toast. Thirsty just eats them whole. Right now he's eating cat briars, the only green leaves since so much turned brown in that hard freeze last weekend. This makes me very happy. I hate cat briars. He seems to get them caught in his antlers and snatches them down out of the bushes too, which I appreciate. I hate those things. Oh, but now he's at the birdbath again. It's kind of startling to turn my head from the computer screen and there's this giant creature at my elbow. 1:31, still drinking. 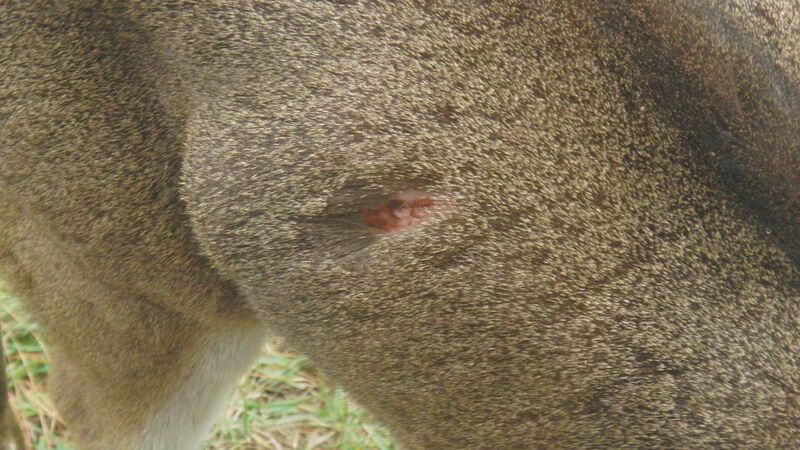 He got real close to the house again and I could zoom in on that wound in his side from above. It has a distinct round hole to it, just looking at the display on the camera. I wonder if it might be a graze from an arrow or a gun and not where he broke off that piece of light'rd jumping in the bathtub? I'll need to get up my nerve to zoom in on it on the computer after I upload this memory card in a minute. I may need to consult some experts -- people who have cleaned a lot of dead deer and seen injuries like this, and my emergency vet friend out west. He's just standing there. I guess I'll upload it now. And now he's drinking. I'm not kidding that bathtub was full before he jumped in it. It is down an inch and a half now. OK, warning that there is a gross picture coming up. the siding with those antlers. 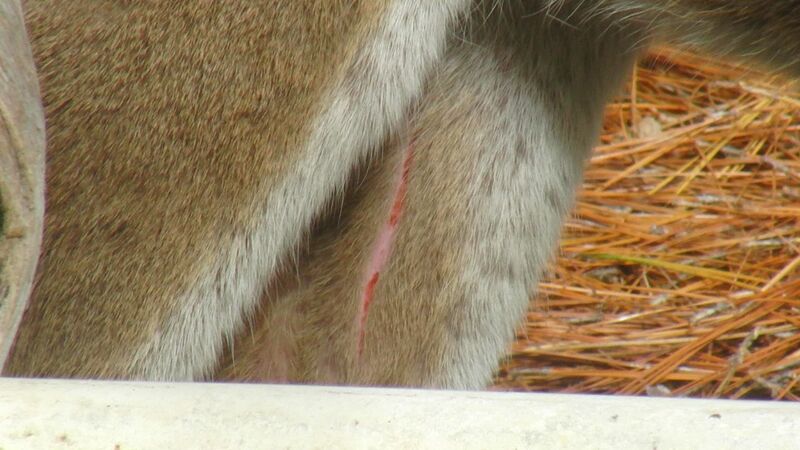 Here's the picture of that wound on his side from this high angle. I decided it's not a bullet hole. by the bathtub. It's the right direction and stuff for it to be that. Maybe that's why he keeps standing by that piece of wood that gashed his side. He's standing there right now rubbing his cheek on it. Maybe he wants it to give him back that piece of fur and skin. Here are his other injuries. They look kind of normal for a deer this well antlered. Surely he has to fight a lot. His nose is scratched up. More than yesterday. Some bad scratches on the inside of his right hid leg. Another view of the leg scratch. Generally he looks a bit more beat up than he did yesterday. I think he may have gotten in a tussle with something with claws and some fight in it, like a wildcat or a coyote. Or else he stepped in a hole like he keeps doing and just scratched it on a root. It's 1:51 and he's still there by the birdbath eating briars out of dead bracken fern. 3 hours. I need another cup of tea. Wonder if the microwave beeping will bother him? It didn't bother him at all. He's wandering off into the woods now. 2:00 and he finally quenched his thirst. 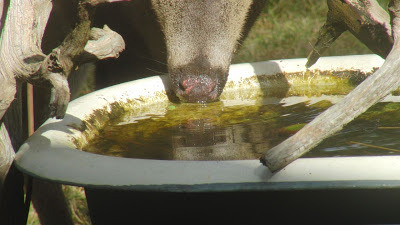 Deer herds in the southeastern coastal plains, south Florida, and Texas consistently have antibodies to multiple EHDV and BTV serotypes, indicating a high rate of previous viral infection; however, clinical disease in these regions is rare. But this article from September 16 from the local TV station said they had an outbreak of epizootic hemorrhagic disease (EHD) in Florida. Deer infected with EHD may have pronounced swelling of the head, neck, and tongue, and often have large ulcers in the mouth. Infected deer are often found near water and may be lethargic, lame and emaciated. 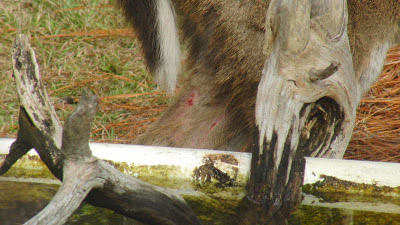 The FWC is monitoring the health of the state’s deer herd and is examining deer for EHD and other diseases. Sightings of sick or dead deer can be reported to the FWC by calling 866-CWD-WATCH (866-293-9282), which is the state’s chronic wasting disease hotline number. I wonder if I should call them up? Wrong state, not sure they care. Does his head look swollen? I thought his eyes look sunken, but lots of older deer start to get a big brow. His tongue looks normal. He showed it to me a lot. The prion disease called Chronic Wasting Disease is not present in Georgia, according to the DNR website which honestly looks pretty dated. They did a study in 2002. I don't think Thirsty is chronically wasting. The Georgia DNR website also says deer in Georgia only have 2 factors influencing antler size -- age and nutrition. 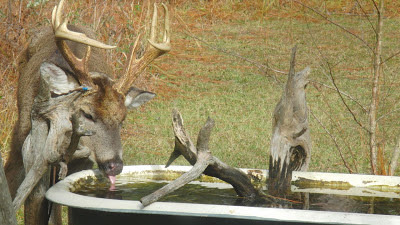 So if Thirsty has such fine antlers he has to be fairly old and very well fed, which kind of leaves out chronic wasting. If he has a fever he would be extra thirsty. He could have a fever fighting off infections from all those fighting injuries. Or it could just be that he gets around a lot at night and there's no water anywhere because of this obscene drought. We've had enough sprinkly rain lately to grow mushrooms but all our creeks are dry as a bone and the 90 acre lake is down to about a 2 acre puddle. Maybe Thirsty is just ordinary dehydrated and that's what makes him stagger. He did walk a lot straighter at the end of his 3 hour recess in my yard. How about rabies? Possible explanation for thirstiness, acting a little weird, and not being afraid of you when you slammed your car door.